Cleveland and the surrounding area have a variety of interesting shopping venues, from the architecturally interesting Avenue at Tower City to the new multi-use shopping "cities," Legacy Village in Lyndhurst and Crocker Park in Westlake. The Terminal Tower at Public Square, built in 1930, is the architectural symbol of Cleveland. Originally set atop the Union rail terminal, the beautiful ground level space has been transformed into a spacious and beautiful shopping and entertainment complex, featuring such retailers as Ann Taylor and Brooks Brothers as well as a cinema complex, restaurants such as the Hard Rock Cafe, the Ritz Carlton Hotel, and a large food court. Crocker Park, opened in 2004, is a 75-acre, park-like complex of retail shops, restaurants, offices, and apartments, located about 30 minutes west of Cleveland in Westlake, Ohio. 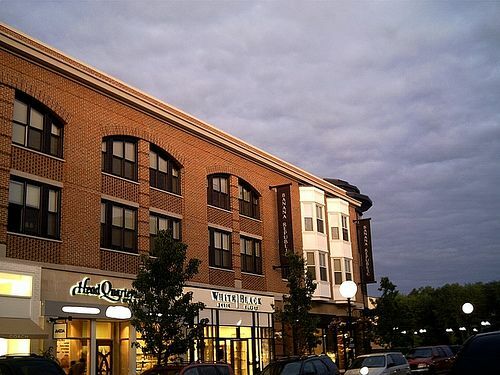 Its picturesque cobblestone walkways, fountains, and town square make it an ideal place to shop, dine, work, and live. Legacy Village is a shopping, dining, and entertainment complex, located east of Cleveland in Lyndhurst, Ohio. The upscale, outdoor mall, opened in 2003, combines a variety of interesting restaurants with popular home furnishing, clothing, and housewares retailers. The result is aesthetically pleasing and fun. Eton Shopping Center, located east of Cleveland in the suburb of Woodmere, is a stylish collection of unique stores, services, and restaurants. The beautifully-landscaped shopping center looks more like a European village than a mall and features lots of outdoor seating in the summer as well as a generous number of chess tables. Beachwood Mall, located east of downtown Cleveland in Beachwood Ohio, is an upscale shopping facility, anchored by Nordstrom's, Saks Fifth Avenue, and Dillards. The enclosed mall with over 150 retailers, services, and restaurants is easy to get to from all over the area and offers ample free parking. Great Northern Mall, located 15 miles west of downtown Cleveland in North Olmsted, operated by the Westfield Group, is a 1.1 million square foot, modern, one-level shopping plaza with 150 retail stores and services, including anchors, Sears, JC Penney, Macy's, and Dillard's. The mall is also surrounded by numerous shopping plazas with major retailers, such as Home Depot, Joann Fabrics, and World Market. The new Shoppes at Parma (formerly Parmatown Mall) is located just 20 minutes southwest of downtown Cleveland, in Parma. The mall, which is currently being remodeled, features more than 150 retail stores, services, and restaurants. SouthPark Center Mall is located south of Cleveland, Ohio in the suburb of Strongsville. The newest of the area's enclosed malls, this sparkling shopping mall features 241 retail stores and services and 18 restaurants. There's something for everyone at SouthPark. Summit Mall is an upscale mall, located on Market Street in the northern Akron suburb of Fairlawn. The mall, anchored by Dilliard's and Macy's department stores, features over 120 stores, services, and restaurants. If you're driving from Cleveland, it's just an easy 45 minute drive down I-77 from downtown. Great Lakes Mall, in Mentor Ohio, is located about 20 miles east of downtown Cleveland. The spacious mall is anchored by Macy's, JC Penney, Sears, and Dillard's and features more than 150 specialty stores.